What Day Of The Week Was July 16, 1948? 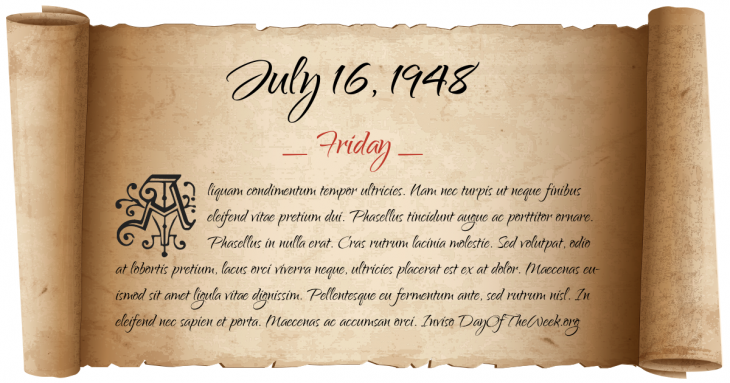 July 16, 1948 was the 198th day of the year 1948 in the Gregorian calendar. There were 168 days remaining until the end of the year. The day of the week was Friday. A person born on this day will be 70 years old today. If that same person saved a dollar every day starting at age 3, then by now that person has accumulated $24,751.00 today. Following token resistance, the city of Nazareth, revered by Christians as the hometown of Jesus, capitulates to Israeli troops during Operation Dekel in the 1948 Arab-Israeli War. Who were born on July 16, 1948?